I didn’t like my wide, angular and dull face. My face looked flat without a V-line. So I always had long hair to cover my square jaw. I was not confident with my profile because of the tip of my nose. My nose was hooked, so I had a tough image. I didn’t want to cover my face with hair and took photos sideways. So I decided to have surgery to have a voluminous face and soft image. 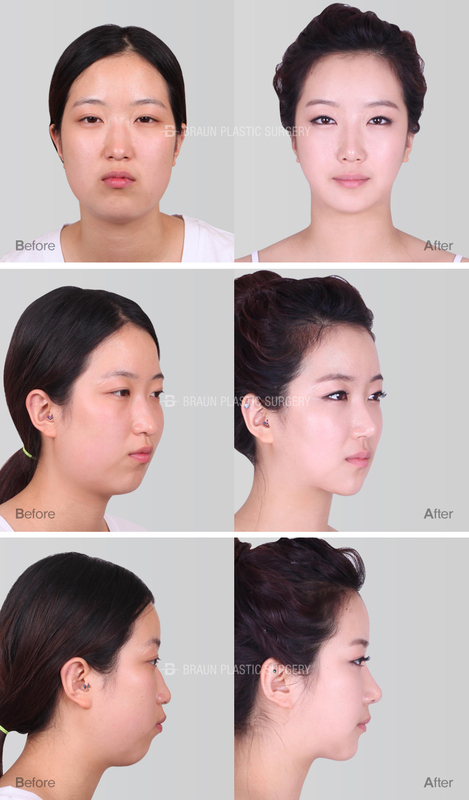 Because of her wide face and asymmetric chin, her facial bones stood out, making her face wider and dull. Her facial line wasn’t smooth due to her protruding mouth. Also, her nose gave her a strong image and her low glabella and downturned nose tip made her nose long. After surgery, I have the confidence of my 20 years. I can put my hair up confidently now. In a photo, I have a V-line from every angle!! I love Braun, who gave me confidence and self-esteem. took a brief photo and finally consulted with my doctor and went into the operating room. I felt a sense of tension. which soothed my mind a little, and I fell asleep with anesthesia. I heard my nurse's voice and I was in the recovery room. My nostrils were blocked and my mouth and throat were filled with blood sputum. It was hard to breathe. I was glad that the pain was not worse than I thought. I was very greatful that nurses came to check on me from time to time and took care of me thoroughly. but the swelling inside of my mouth was the worst. On the 3rd day, it got better. Maybe it’s because of the pumpkin soup or ice pack. So I went out wearing a mask and went in to get a shot and to see my doctor. On the 5th day, I got the splint and stitches removed and received skin care. I felt great after. But I still had swelling in my mouth and jaw. I did gargle often, put ointmenton, and ate only soup until the 5th day. Fun to check on my face changing. I felt uncomfortable doing my everyday life routine, but I could see a line. On the day of stitch removal, it didn’t hurt. I went out putting make up on!! My friend told me my face got smaller already. I had swelling left though. I was hoping for swelling to be gone and to be pretty!! My smaller face and natural line. I could move my jaw up and down so I could eat a hamburger. My face was getting smaller everyday and the line became natural. The front was ok but the profile was not ready yet. I was told all the swelling is gone after 3 months, so I needed to wait. I was waiting for the day and did massage and jaw exercises. 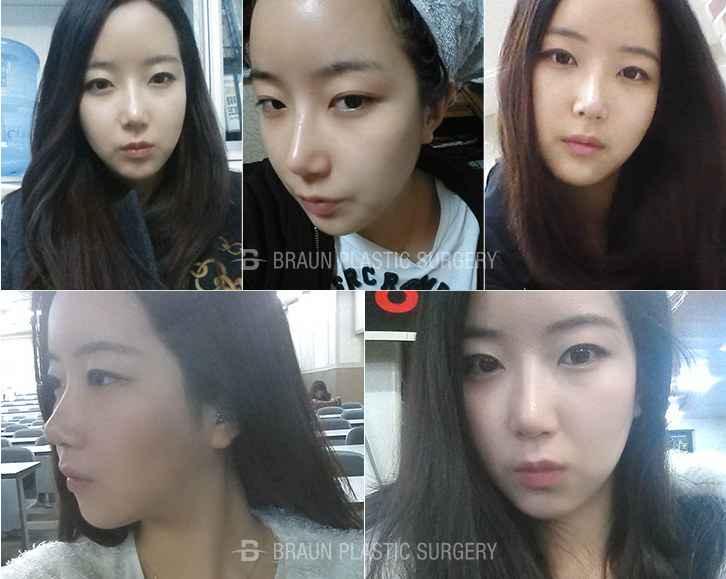 My nose became natural and the movement of facial muscles and nose was natural. I was especially happy about my slightly upturned nose tip. And my nose surgery made my protruding mouth look better. I felt like it’s not long ago that I was nervous on the operation table, but 6 months has passed. which makes me feel like I didn’t have surgery. I look at the mirror and I am so satisfied, especially with my profile. I only had straight hair to cover my face before, but now I can do any hair style. My face got smaller and my image got softer. My confidence is going up every day!! I really thank Braun for giving me this confidence. we will contact you after confirmation.